DreAms is a short film project in the series of events "Homecoming 2015",held by HAO (Hanoi-Amsterdam Organization) in celebration of the school's 30th Anniversary this December. Participating in the cree of DreAms are undergraduates and postgraduates of Hanoi-Amsterdam - School for the gifted.The director of the film is Mr.Tien Anh Dang (Amser 07-10) - an up-and-coming director who once won a Golden Kite award in 2014 for the short film The Girl in the attic.The executive producer is Ms. Thuy Linh Hoang (Amser 10-13), a person who has had ex perience in different positions in a number of other young film crews. 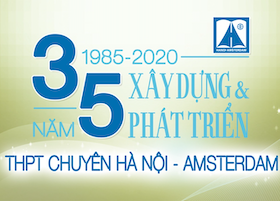 The short film "DreAms" will officially be presented in the Hanoi Amsterdam's 30th Anniversary Gala this December. Members of the project set strict standards in order to bring out a product of excellence and quality. They also hope that the film will meet the requirements to be shown in cinemas, worthy of the reputation of Hanoi Amsterdam's leading position in all fields.